You must make it clear with your expectations and then with your actions that their behaviors are not accepted. You do this for them, for you and for the team. You must own this responsibility. You must set very clear expectations. So crystal clear that there is no room for interpretation. You must also take action by speaking with them each and every time you witness inappropriate behavior. Secondly, you must appeal to their beliefs. Let me explain why. There are two things that drive someones behaviors. They are their values and their beliefs. This is best illustrated by a story about me. Early in my career I had a mentor, who was also my boss, who saw great potential in me. One day a couple of weeks before Christmas, he called me into his office and handed me a gift. He told me to open it right then and there. I was so excited that he thought this much of me. When I opened it I saw a gold plated watch. 'Wow, thank you', I said. Without missing a beat he told me that I had great potential but that I was disrespectful to him. He then paused. I took a step backwards from the obvious turn of events and asked him to explain. He went on to tell me that when I show up late for meetings he has called, that it is disrespectful to him and our team. He went on to tell me that with that watch and with the expectation he outlined, I would not be late again and if I was late, I would be looking for another job. To say the least he helped me set some new beliefs at that very moment. He was right. He taught me a very valuable lesson that day. Guess who was early for meetings after that? So why was it so easy for me to come in late and not give it a second thought? It was because of my values. My value around time comes from deep within me. It is not something that is easily changed, if not at all changeable. If you and I were to plan to meet on a Saturday morning to go fishing at eight o'clock in the morning, I may show up at fifteen minutes early or fifteen minutes late. To me and my concept of time, that is close enough to eight to count as on time. I value freedom and little constraint. You may relate to this or think it is ridiculous. Either way, that is one of my values. Can you see how my value of time got in the way of what my actions should have been in the work place? So if my values are deep seeded and I had to change, what had to happen? My mentor had to appeal to my beliefs. It took him intervening into my behavior patterns to awaken within me the desire to override my value with a new belief. Had he argued with me about my value of time, nothing would have changed. He nor anyone else could change my values, only me. Usually, the only thing that spurs us to change our values are a tragedy or traumatic event in our lives. A near death experience, a divorce, a spiritual change or something of that nature is when we sometimes search deeply and change our values. Regardless of the reason, only we change our values. For you to change the behaviors of an employee, appeal to their beliefs. If you continue to try to change their behaviors and things don't seem to be changing, it may be that your are trying to change their values and not their beliefs. You have to spell it out for them so clearly that the needed change and the consequences for not changing are crystal clear. They can and will change their behaviors if they believe in the needed change. 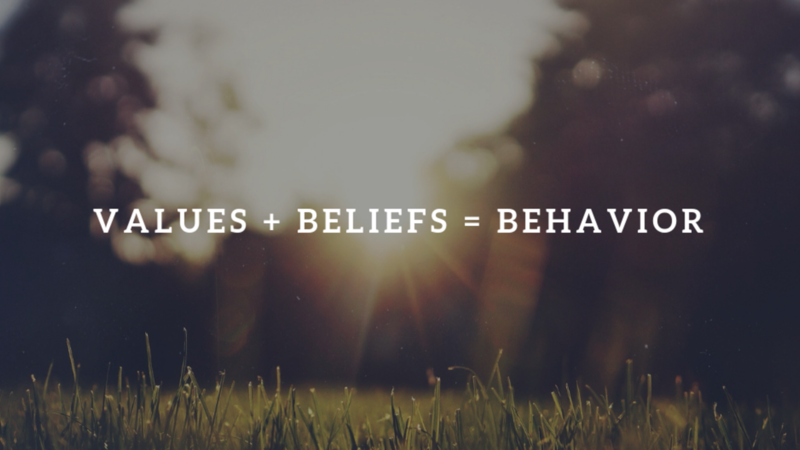 If they place their values above the belief they would have to entertain to make a change or if they simply don't believe in the behavior change, then they will need to leave or you will have to help them leave the organization. Lastly, as a leader, you must be exhibiting the behaviors you desire to experience from your people. You cannot hold each member of the organization to a higher standard than what the leader must abide by. That is the surest way to undermine the culture and the performance of the team. Lead by example by doing more and better than what you would expect from your team.